As a consequence of the joint and rapid evolution of the Internet and the social and behavioral sciences during the last two decades, the Internet is becoming one of the best possible psychological laboratories and is being used by scientists from all over the world in more and more productive and interesting ways each day. 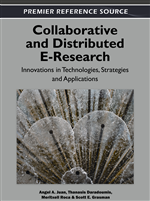 This chapter uses examples from psychology, while reviewing the most recent Web paradigms, like the Social Web, Semantic Web, and Cloud Computing, and their implications for e-research in the social and behavioral sciences, and tries to anticipate the possibilities offered to social science researchers by future Internet proposals. The most recent advancements in the architecture of the Web, both from the server and the client-side, are also discussed in relation to behavioral e-research. Given the increasing social nature of the Web, both social scientists and engineers should benefit from knowledge on how the most recent and future Web developments can provide new and creative ways to advance the understanding of the human nature. Cognitive psychology has traditionally kept a special relationship with computer science. In fact, the “cognitive revolution” usually refers to the joint developments that took place in the mid 1950’s and 1960’s in computer science and psychology, together with those of other cognitive sciences (linguistics, philosophy, anthropology, and neuroscience). Initially, psychologists were interested in computers mainly because they provided a novel and interesting model on how the brain might work (Gardner, 1985). Behaviorists had complained that cognitive concepts were difficult to apprehend in mechanistic and reductionist terms and that they should, therefore, always be avoided in scientific psychology. However, computer science showed for the first time that simple, mechanic devices were also able to process information and perform many cognitive tasks that had sometimes been assumed to remain beyond the realm of science. Soon, psychologists proposed that the human brain was just a peculiar type of computer and that the mind was a kind of software running on this “hardware.” Moreover, cognitive scientists started to describe cognitive processes in a program-like manner and even tried to simulate these processes in standard computers (Newell & Simon, 1972). For a long time, this was the main role played by computers in cognitive psychology. However, during the 1980’s, when computers became cheaper and the recently developed high-level programming languages made their use more accessible, psychologists started to use computers with a new purpose in mind. Instead of just using them as an abstract model of how the mind works, psychologists began to use computers as an additional tool in their experiments. Computers simplified the presentation of stimuli to participants and the registration of many types of responses to those stimuli. In fact, any researcher with rudimentary programming skills could easily conduct classical laboratory experiments with only the help of a desktop computer. The old laboratory in which a different apparatus had to be used for each different experiment was soon substituted by laboratories in which computers were used to run all types of experiments, including tasks as different as: a) spatial navigation through different types of mazes, b) memory tasks with different lists of words, or with images or sounds, c) reading comprehension studies using different types of stories and distracting stimulation, d) reaction-time studies, e) subliminal perception involving words or images or sounds presented so rapidly that they could not be consciously processed, f) Pavlovian and operant conditioning including visual or auditory stimuli as well as different types of responses (from keyboard to mouse to vocalizations), g) divided attention, h) social dilemmas, or any other interesting research question a psychologist could think of. Thus, by the time the World Wide Web was created, in the early 1990’s, most experimental psychologists were already used to having computers in their labs and using them extensively in their experiments. It was only a matter of time before some researchers made the first steps towards taking advantage of the new opportunities offered by the Internet as a multipurpose and world-wide psychology laboratory. There is no doubt that this world-wide laboratory is also of great value to other social and behavioural sciences interested in human behaviour, beliefs, attitudes, and social relations. These include education, economics, marketing, anthropology, sociology, and politics, but this list is certainly not complete. Indeed, any scientific discipline interested in how people reason, learn, relate to each other, process information, and respond to it, should benefit from using the Web as a platform for e-research. Although focusing on examples from our own field of expertise, experimental psychology, the present chapter should become a useful guide for other social sciences as well.